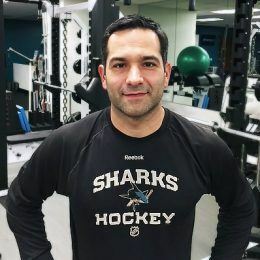 As the head strength and conditioning coach for the San Jose Sharks for the past 11 years, Mike Potenza has established himself as one of the league’s leading experts in preparing the pros. During his tenure with the team, the Sharks have punched their ticket to the playoffs a remarkable ten times, collecting a handful of division championships along the way and advancing to the Stanley Cup Finals, in 2016. Getting an NHL team ready to perform at a consistently high level over the course of an 82-game season requires creativity, agility and most importantly, the right information. In a recent interview, Potenza talked about his approach, philosophy, and the challenges of working as a trainer at the highest level of sports. He also, more recently, talked about how he uses Firstbeat Sports to provide the physiological data he needs to help keep a diverse roster of athletes competitive year after year. Trust is a vital component of a productive trainer-athlete relationship. To build it, Potenza encourages players to consider his role with the team as “an investment banker for your body.” Cultivating this perspective creates buy-in from the Sharks roster. “I always ask [players], you’ve got someone watching your money and your investments, but who’s watching your biggest asset? If your body breaks down, you don’t have an opportunity to stay in the league physically, because you can’t keep up,” he says. In professional sports, margins are slim and one-size-fits-all approaches to preparation mean missing out on performance potential. As a result, expert trainers prioritize understanding what works best for each individual player. Adding to the challenge is the fact that an athlete’s body changes over the course of the season, and even more dramatically over the course of their career. Technology offers powerful solutions under these changing conditions, revealing easily and instantly what is happening inside an athlete’s body. Experts rely on this data to explore the complex relationship between what athletes do and how it impacts their bodies. During Sharks training, players wear heart monitoring chest-belts beneath their gear, which transmit data wirelessly to a Firstbeat receiver plugged into a laptop next to the ice. 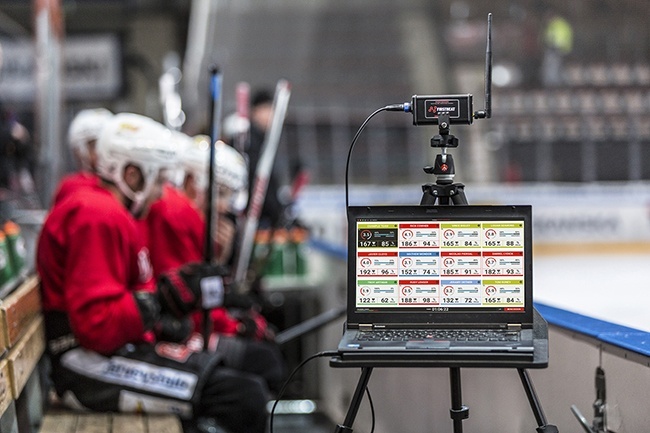 Incoming monitoring data is instantly analyzed on a beat-by-beat basis with outputs displayed on the screen, giving Potenza and the rest of the Sharks training staff real-time to feedback and insight for each player. Today roughly half of the teams in the NHL rely on the Firstbeat Sports platform for their training load and recovery monitoring needs. San Jose is among a growing number of NHL teams that utilize Firstbeat Sports for insight beyond their current roster, using the same platform as a player development tool for their AHL affiliate roster, the San Jose Barracuda. It is also widely utilized in the NCAA and by top European hockey clubs. Easy access to training load and recovery data is fundamental to a modern training approach. Removing guesswork from the equation, data allows pros to focus their expertise where it matters most. It also helps ensure that on ice training sessions, planned by the head coach, are complemented with the right kinds of off-ice activities. “Whatever bucket they aren’t filling on the ice, we’re going to fill that off the ice,” says Potenza. Training Impulse (TRIMP) and Training Effect (TE) are two metrics Potenza describes as essential to keeping track of the incremental strain on their bodies each player acquires during training. These are tools that help navigate between under- and over-training. TRIMP scores are produced using a combination of heart rate, expressed in terms of percentage of a player’s maximum heart rate, and the amount of time spent at that heart rate intensity level. Higher intensity levels are weighted in the formula, allowing the TRIMP accumulation curve to model the accumulation of lactate in the muscles. Taking advantage of cutting-edge analytics has allowed Firstbeat to modify the classic formula to leverage more granular changes in heart rate function than the original version, which dates to the early 1990’s when practical heart rate monitoring technology was still in its nascent stage. Training Effect (TE) unlocks a different perspective on training load management. Based on Firstbeat’s advanced excess post-exercise oxygen consumption (EPOC) modeling capabilities, TE-scores anticipate the impact a session will have on the development of a player’s aerobic and anaerobic capacity. Once assessed impacts are reported on a scale from 0.0 to 5.0, which is modified for each player based on dimensions of their personal physiology. Accompanying each score is a bar graph that reveals the distribution between aerobic and anaerobic efforts as a contributing percentage of the whole. In the NHL, time is a limited resource and a valuable commodity. Experts, like Potenza, view access to accurate physiological data as a competitive advantage in their constant struggle to focus attention on areas where it can make the biggest impact. “When you have a limited amount of practice days during the year, a coaching staff needs to get the most out of the players tactically, emotionally, cognitively and physically,” he explains.